Pain from cavities is one of the most horrible experiences you can endure in life. Due to their proximity to several nerves, ignoring toothache is nearly impossible. If you are in pain, find a dentist near you and visit him right away no matter how much you hate them. Thankfully, modern dentistry is relatively pain-free, and you can experience some relief in a matter of hours. Have you ever wondered what exactly a dentist does to take away your pain? A qualified dental professional takes several steps to save your teeth and provide you with some immediate relief. If your face is swollen, it means the bacteria has spread beyond the teeth and caused an infection in your mouth and maybe even your jaw. The first step would be to stop the infection from spreading further. Your dentist might prescribe a course of strong antibiotics and painkillers. The painkillers will give you relief from a toothache while the antibiotics control infection and reduce the swelling. Your dentist is likely to take an x-ray to figure out the extent of the damage. If the cavity is not very extensive, a surface filling will suffice. But if it goes too deep, it may need a root canal, a filling, and a cap. In some cases, if the tooth is no longer salvageable, he may have to extract it completely to prevent further damage to the gum. Once you are relatively pain-free and the dentist is certain of having controlled the infection, it is time to drill your teeth. A local anesthetic is used to numb your jaws. Some dentists may even give you nitrous oxide to calm you if you have too much anxiety about dental work. Once the jaw is numb, and you are relaxed, the dentist will use a water drill to create an opening to reach your cavities. The extent of the drill is determined by how far the cavity has reached. If only a part of your teeth is affected and the roots are untouched, he will drill to remove the cavity completely, until he reaches healthy teeth material. 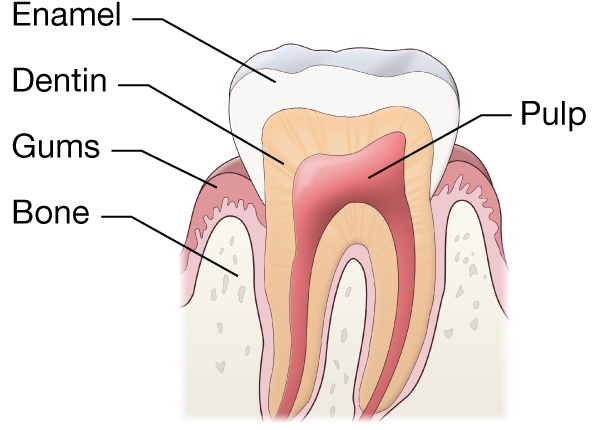 But if the root and pulp are affected, your dentist may use special tools to perform a root canal treatment. He will remove dead roots and nerves, apply some antibiotic and put a temporary seal in place. The antibiotic will kill any remaining bacteria and the temporary seal will ensure food particles do not enter the cavity. Your dentist may suggest a follow up in 3-4 days to continue the work. In the next session, he may insert some needles into the cavity and take another x-ray to ensure all roots are covered. He may perform another root canal cleaning if he notices further decay. The gap between the first procedure and second allows him time to evaluate if there is any secondary infection or decay. This time, a dental assistant would take a mold of your affected teeth to order for a custom cap in case you had a root canal. If your teeth decay is superficial or only a few millimeters deep, your dentist is likely to seal it with an inert material. Typically, it could be filled with metallic fillings like gold, amalgams like silver, a composite material like resins of quartz or glass or even ceramic substance. Amalgams have been a popular filling for the last 100 years. Made of several metals, they are strong and lasts a lifetime. They are also the least expensive material to be used as a filling. But in the last two decades, there is a rapid reduction in its usage due to fear of mercury leeching into the body. So, none of the dentists in western countries use it anymore. If you can afford it, gold is considered as one of the best filling materials. Ceramic is becoming the most popular option due to its low cost and low maintenance nature. You get to choose which kind of filling you want, especially if it is a surface filling. But if your decay goes deep and you need a cap, the filling material becomes less important since no one can see it. A ceramic filling is most commonly used when treating root canal decay. But you can choose the type of cap for your tooth. You can choose an expensive porcelain cap, a gold one or a combination of dental ceramic and a metal alloy. The cap will be put on the teeth and sealed permanently. While you may notice this cap in the beginning as it feels foreign in your mouth, within a few days, it becomes normal, and you can treat it like your other teeth. Cavities are a tricky business and should never be neglected. The faster they are treated, higher are your chances of saving your teeth. If you dive underwater, make sure you tell your dentist about it. He may use special techniques to ensure there is no air bubbles or gaps within the filling. This way, even when you go underwater, you are free from a toothache. This article is a guest post. Your details will NEVER be sold or shared and you can unsubscribe at any time. This is a Spam Free site. How do Braces Behind the Teeth Work? Is Invisalign Really Better Than Braces? We may earn a small commission for any endorsement, recommendation, testimonial, and/or link to any products or services from this website. Your purchase helps support our work in bringing you real information about dental health, treatments and holistic dental wellness. When you click on an affiliate link to purchase an item, you will buy the item from the seller directly. Amazon and/or other companies pay this website a small commission or other compensation for promoting their website or products through their affiliate program.